Born in Lisbon in 1973,Â InÃ?ÂªsÂ Teixeira do RosárioÂ received aÂ PhD in EcologyÂ from the University of Lisbon and has a particular interest inÂ reptiles, amphibians and mammals. 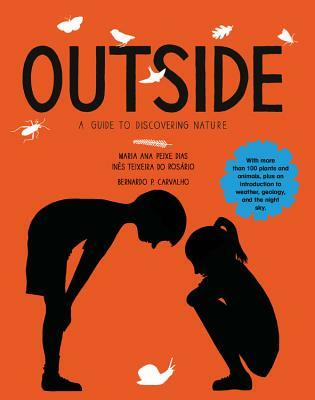 Born in Portugal in 1976,Â MARIA ANA PEIXE DIASÂ received her PhDÂ in Biology from the University of Lisbon, beforeÂ migrating for a short time to Great Britain to work with BirdLife International, the world's largest nature conservation partnership.Â Since her early childhood, Maria has showed a particular interest in the insects and plants taking over the suburban gardens and vacant plots of her local neighbourhood. "Beautifully designed with black and white line drawings, this large tome gives the feeling of a home textbook. It provides information and activities that will inspire interest in the outdoor world." "It's a big book - almost 400 pages - with lots of drawings, watercolors, and text answering many questions about animals and other aspects of the natural world, like "Why do birds make nests?" It appeals to a wide range of ages - I'd say kids from eight to 14, depending on whether they are reading it with an adult or on their own."